Authorities in Morocco adjourned to Aug. 18 the trial on Thursday of suspects in an April 28 bomb attack on a cafe in the resort of Marrakesh that killed 17 people, including eight French nationals. Chief suspect Adel Othmani is accused of disguising himself as a guitar-carrying hippie to plant two bombs in a tourist cafe. 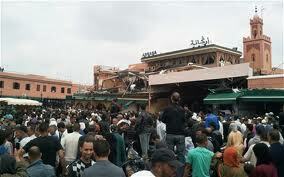 The interior ministry said he showed loyalty to al Qaeda but local affiliates of the group have denied involvement. Defence lawyers sought the conditional release of Abdessamad Bitar, who is accused of aiding Othmani. Legal sources said judges were unlikely to grant the request. Four others will also be tried at the court in Sale, which lies across the Bou Regreg river from the capital Rabat, for failing to notify authorities after allegedly learning from Othmani that he had carried out the attack. The blasts were the first such attack in Morocco since suicide bombings in the commercial capital, Casablanca, in 2003, and added to challenges facing King Mohammed at a time of street protests inspired by uprisings in the Arab world. Western security experts said the aim was probably to damage the tourism industry on which much of the economy depends. Othmani’s family say he is innocent and was forced into a confession.